What are the misspellings for telling? What are the common mistypes for telling? 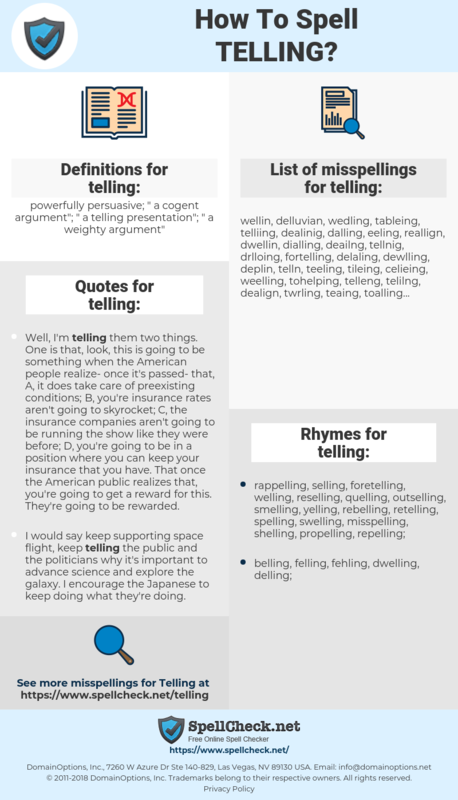 What is the definition of telling? What are the quotes for telling? What are the rhymes for telling? What are the translations for telling? 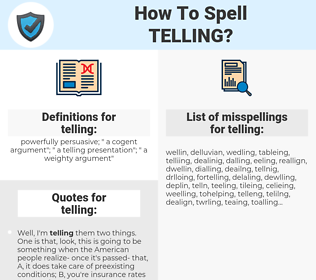 What are the common typos for telling? powerfully persuasive; "a cogent argument"; "a telling presentation"; "a weighty argument"
This graph shows how "telling" have occurred between 1800 and 2008 in a corpus of English books. Well, I'm telling them two things. One is that, look, this is going to be something when the American people realize- once it's passed- that, A, it does take care of preexisting conditions; B, you're insurance rates aren't going to skyrocket; C, the insurance companies aren't going to be running the show like they were before; D, you're going to be in a position where you can keep your insurance that you have. That once the American public realizes that, you're going to get a reward for this. They're going to be rewarded. First, speaking for myself, I don't want to ever be in a position where I'm telling other directors how to make movies, because I don't think it's any of my business. In the process of telling the truth about what you feel or what you see, each of us has to get in touch with himself or herself in a really deep, serious way. veelzeggend, verhalend, sprekend, veelbetekenend, tekenend. treffend, bezeichnend, aufschlussreich, vielsagend, sagend, berichtend. certero, contundente, narrativa, expresivo, elocuente, revelador.